Sometimes it's hard to understand for foreign customer how much product costs in their own currency and if they can afford it. A new custom block Currency Converter provided by our partner FloatRates company allows to convert different amounts into multiple currencies right on the spot without leaving the site. Go to CMS > Pages Layouts click on, for example, Products Listing Page and select Currency Converter from Custom Blocks drop down menu on the right side. 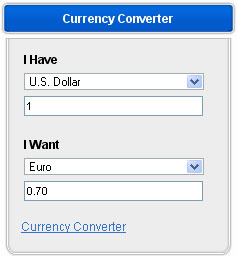 Note: if you upgraded your shop and don't see Currency Converter block you need to go to CMS > Custom Blocks and create a new custom block where insert the code from http://www.floatrates.com/currency_converter page.